The Cooper Hewitt Smithsonian Design Museum doesn’t get as much attention as some of its more famous members on Museum Mile but it has a lot to offer. The museum is located in the former home of Andrew Carnegie, a sixty-four room mansion built from 1899 to 1902. It is the only museum in the United States devoted exclusively to historic and contemporary design. The Museum was founded in 1897 by three Hewitt sisters, who were granddaughters of the industrialist, Peter Cooper. The Cooper Hewitt underwent a major two year restoration, completed in 2015. The character and grandeur of the building was maintained while providing contemporary upgrades in everything from lighting to interactive exhibits. When you arrive at the admissions desk you are given a “Pen,” which is linked to a code number on your ticket. As you roam through the museum you can use the pen to store information and photographs, as well as to draw on the interactive tables. You can then access your visit on any computerized device, seeing everything you’ve saved and created. 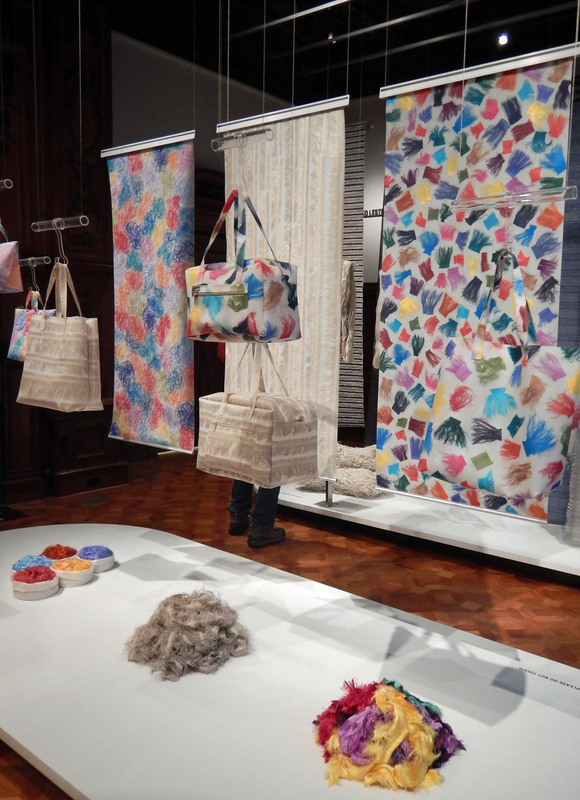 I was drawn to the Scraps: Fashion, Textiles, and Creative Reuse exhibit by three women: Luisa Cevese from Milan, Christina Kim from Los Angeles, and Reiko Sudo from Tokyo. These designers reuse textile materials, incorporating scraps and cast offs in the creation of their works. Luisa Cevese repurposes silk threads cast-off from industrial silk manufacturing, along with polyurethane and metallic fibers, in her work. I was particularly enamored with her pieces, which were quite varied in their approach. 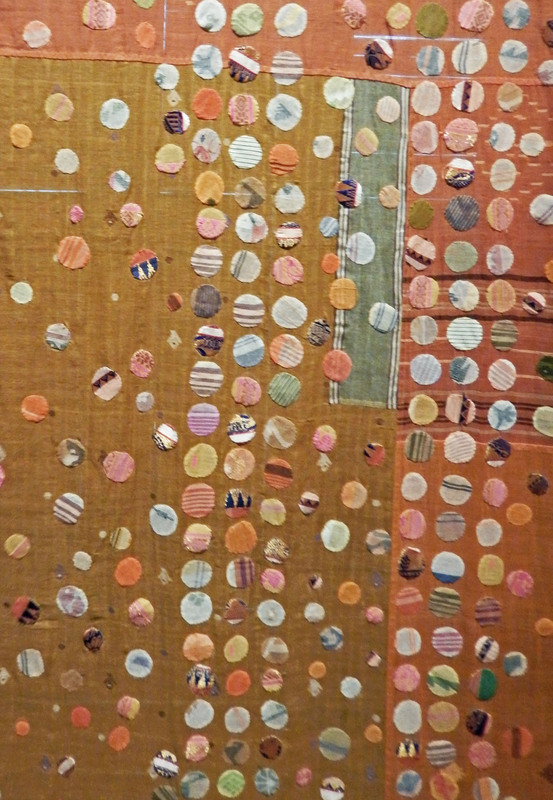 In one textile panel she used scraps of second-hand saris. A line of purses featured cast off silk selvedges. She also made beautiful table mats using polyurethane embedded with off cuts of mixed metallic fibers. 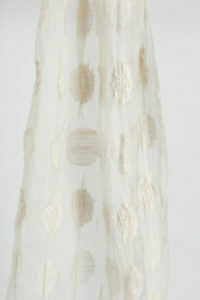 A tikdis shawl by Christina Kim was among my favorites by this designer. 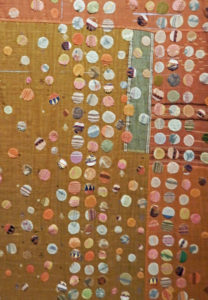 She appliquéd tikdis dots of brocaded cotton jamdani scraps onto a silk metallic fabric. Jamdani is a fine muslin cloth on which motifs are woven on a loom. Kim also designs light and airy clothing, created using jamdani scraps. 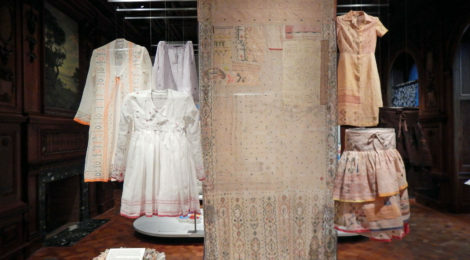 Although the exhibit is relatively small, there is a lot of information with regard to the silk industries, their waste, and the potential for recycling cast offs and fabrics. The exhibit was an inspiration from an artistic perspective, as well as a display of innovative ways to reuse industrial waste and time worn fabrics. will request the special “pen” at the admissions desk. 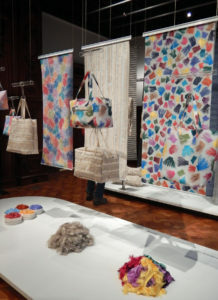 I have always loved the Cooper Hewitt but it has been a while since I have been there, This show will bring me back! Thank you so much Heather! I grew up in NY and have never been to this museum, but you have definitely inspired me, and I am going to try to go! Looks like a fascinating show! Thanks for bringing it to our attention! Nice review. I loved the old museum, must see the renovated Cooper Hewitt. The pictures make me want to haul out my sewing machine. ← What is Your Studio Muse?